How Long Does Residential Solar Installation Take? So you’re ready for your residential solar energy system installation. How long will it be before your PV project is complete? The answer depends on the size and complexity of your photovoltaic installation. It may also depend on the experience and commitment of your solar installer. Solar panel installation projects typically take between one and three months from start to finish. The good news is that most of this time is in the planning — not on your rooftop. Once you sign a solar installation contract, your professional contractor will get to work finalizing the design and ordering your photovoltaic components. Then there’s the paperwork. Home PV installations usually require building permits, specific to where you live. Your contractor will obtain any necessary permits, but that can take a week or longer if the local building department is backed up. In addition, your photovoltaic installer will compile all the documentation needed for you to apply for the federal solar tax credit and any available state or local financial incentives. Once you’re all set with the proper paperwork, the nuts and bolts of your residential solar installation can get underway. In most cases, mounting the photovoltaic panels is a relatively quick and simple process. Smaller home PV systems can often be installed in single day. Large rooftop solar arrays or hybrid systems with battery storage are more complex, so those installations take longer to complete. Still, most residential projects are done in just a few days. However, that doesn’t necessarily mean your photovoltaic array will begin powering your home immediately. If you remain connected to the grid, a representative from the utility company will need to inspect your PV system. In some locations, the city building inspector may also need to sign off. When you work with a professional photovoltaic company, installing a residential solar energy system won’t disturb your daily life. Sure, installation day may be a bit noisy and frenzied, with workers up on your roof. But aside from signing a few documents, you and your family won’t be bothered. You can go about your regular routine. Professional contractors do everything possible to make solar installation convenient for homeowners. No doubt about it, switching to solar power is a home improvement project that won’t give you a headache. The professional team at Intermountain Wind & Solar, the region’s leading photovoltaic installer, takes pride in providing exceptional customer service and top-quality workmanship to homeowners and business owners throughout Utah, Idaho, Nevada, Colorado and Wyoming. Contact us today to schedule your free consultation for residential solar energy. Ground-Mounted Solar vs. Rooftop Solar — Which Is Cheaper? Both ground-mounted and rooftop solar panels offer unique benefits, and both provide you with a free source of electricity for your home. But if you’re like most homeowners, cost will factor into your decision. So which type of photovoltaic array is more affordable? Ground-mounted photovoltaic arrays typically cost more than rooftop systems. The additional materials needed — including reinforced pole structures and cement foundations — are responsible for much of the added expense. Labor charges are also higher for ground-mounted panels, due to the more involved mounting process. In addition, placing a photovoltaic array at ground level puts the wiring components in easy reach of rabbits, squirrels and other backyard pests. To prevent critters from munching on your wires, you may need to bury them. Digging trenches for underground wiring is an extra cost you won’t have with a rooftop array. Rooftop solar panels are faster and easier to install than a ground-based solar energy system, so labor charges are minimal. Plus, the mounting components are much less expensive. However, rooftop installation has one potential added cost — roof repair or replacement. Photovoltaic panels must be mounted on a solid, stable structure. The modules are designed to last for decades, and placing them on a damaged roof is never a good plan. If your roof develops a leak or related problem, the panel array must be removed to fix the problem and subsequently reinstalled. As this is an expensive, time-consuming and complicated process, professional photovoltaic contractors recommend repairing or replacing a damaged roof before scheduling a rooftop installation. Which Type of Photovoltaic Installation Is Right for You? If your roof is in good shape or needs only minor repairs, you can save money by choosing to install rooftop solar panels. However, cost isn’t the only consideration. Some rooftops face the wrong direction for capturing the sun’s energy. Others are shaded by obstructions, such as nearby buildings and trees, or are too small to hold more than a few photovoltaic modules. Under these conditions, rooftop solar panels may not be as effective as a ground-mounted solar installation. A photovoltaic array mounted at ground level can be placed at the optimal orientation and angle for maximum energy production. Ultimately, the best decision for your photovoltaic array will depend on several factors — not just your out-of-pocket expenses. A professional contractor can help you weigh the benefits and drawbacks of each option and offer recommendations for the most cost-effective installation. Homeowners throughout Utah, Idaho, Colorado, Wyoming and Nevada can schedule a free consultation with Intermountain Wind & Solar, the region’s leading photovoltaic installer. Contact us today to learn more about ground-mounted solar and rooftop PV panels. Can You Sell Your Home After Installing a Rooftop Solar Array? If you install a rooftop solar array, what happens if you decide to move? Will you be able to sell your house? Absolutely. You don’t have to live in your home forever to make solar a smart investment in the future. A home photovoltaic installation won’t stop you from selling. In fact, it can be an advantage. When it comes time to sell your home, having a real estate listing that stands out among the crowd will help attract more home buyers. A solar array is an impressive feature for any home. What’s not to like about creating your own electricity and paying little or nothing to the utility company? Advertise your home as solar-powered, and your listing will get a great deal of interest from home buyers. The attention your photovoltaic system brings may also help you close a sale more quickly. According to the Department of Energy Efficiency and Renewable Energy, a division of the U.S. Department of Energy (DOE), homes with rooftop solar systems often sell twice as fast as similar homes without photovoltaic power. Selling your home quickly is great, as long as you can command the right price. With a solar array, you shouldn’t have a problem getting fair market value for your property. And, actually, you may find that your solar-powered home sells at a higher price. Research from the DOE and the Lawrence Berkeley National Laboratory shows that home buyers pay extra for homes with photovoltaic systems — an average of $15,000 more than they pay for comparable, grid-powered homes. So even if you still owe a portion of your rooftop solar costs, your home sale price can offset the amount and possibly create a profit. Homeowners who purchase their photovoltaic systems see the benefits of selling their home faster and for a higher price. However, if you lease your system, you may have a different experience. With a solar lease, you have to make at least 15 to 20 years of monthly payments. Most home buyers aren’t interested in taking over that sort of commitment. And some contracts don’t allow for a transfer of ownership, so you may be forced to pay off the lease before selling your home. Financing a home solar array is affordable for most homeowners today, thanks to the wide range of options. Many lenders don’t require money down for photovoltaic installation, and payment plans offer flexible terms. Investing in a photovoltaic power system simply makes better economic sense than leasing. If you would like to learn more, Intermountain Wind & Solar has answers. We’re the leading professional solar installers for homeowners throughout Nevada, Idaho, Utah, Colorado and Wyoming. Contact us today to learn more about installing a rooftop solar array at your home or business. Can You Install Photovoltaic Panels on a Flat Roof? If you want to install photovoltaic panels at your home or business, a flat roof is not a problem. In fact, if your house has a flat roof, you may be better off than homeowners with pitched roofs. As long as your rooftop is in good condition and has no shading from trees or nearby buildings, you can go solar with confidence. With a pitched roof, the orientation of a home PV array is dictated by the direction and angle of the structure. While adjustments can be made to harness more of the sun’s energy, optimizing photovoltaic power can be challenging on a roof that doesn’t face south or west. On your roof, however, solar panels can easily produce maximum photovoltaic power. The flat surface gives you the freedom to mount your PV array at the ideal tilt and directional orientation. Really, your only limiting factors are the size and shape of your rooftop and working around obstructions like vents, chimneys and skylights. But unless your roof is very small, you should have plenty of space to install an optimized home PV system. Curb appeal is important to many homeowners. Fortunately, today’s solar panels are much less visually obtrusive than those of years ago. In fact, for many rooftops, photovoltaic systems blend in rather well. That said, a PV array installed on a pitched roof can affect the look of the property, as the solar panels can be seen from the street. Because of this, some homeowners’ associations are strict about how and where photovoltaic systems can be placed. Your low-pitch roof gives you a definite advantage. Unless your property is at the bottom of a hill, your photovoltaic panels won’t be visible to your neighbors. A home PV system doesn’t require much maintenance to remain operational for decades. But homeowners may occasionally need to clean bird droppings, leaves or dust from their solar panels, as any debris can cause a drop in energy output. Solar experts also recommend performing periodic visual checks for frayed wiring or loose connections. These tasks can be dangerous for a homeowner, but accessing solar panels on a roof that’s flat is much less hazardous. And if you have to call a professional to handle photovoltaic maintenance, their job will be easier, so you’ll save on labor charges. Can You Use PV Solar to Charge Your Electric Vehicle? A PV solar energy system can easily generate enough power to charge an electric vehicle. If you own an electric car, chances are you’ve noticed a significant increase in your monthly utility bill. Sure, you don’t have to pay for gas, but now you’re paying more for electricity. Invest in a home PV solar array, and you can offset these added energy costs. You may even be able to eliminate your monthly electricity bill. The average electric car requires bout 30 kWh of electricity to drive 100 miles. So if you drive 15,000 miles in a year, you’ll use 4,500 kWh. If you pay the utility company 13 cents per kWh — the national average — you’re spending $585 every year to charge your vehicle. Gas-powered vehicles cost nearly three times as much to run. With gas prices averaging $2.35 per gallon, the cost to drive 15,000 miles is more than $1,400. That said, $585 isn’t exactly chump change. And with electricity costs on the rise, you can expect to pay more in years to come. Switch to using the sun’s energy for power, and that increase in your monthly utility bill will disappear. And depending upon your PV system’s size, you may even see a drastic cut in your overall energy expenses. A professional contractor can design a solar energy system that can handle your increased power usage. Once your PV solar array is installed, charging your electric vehicle won’t cost you anything — after all, sunlight is free. You could opt to install a small solar array, sized just large enough to charge your electric car. However, that may not be the wisest option. Designing a whole-house PV system makes better financial sense. Your PV solar array can be designed to provide for all your electricity needs, inside and out. The sun’s energy can charge your electric vehicle and power your home appliances and electronics. With a whole-house PV system, your overall utility expenses will be much less — and you may even eliminate your monthly electricity bill entirely. Lucrative incentives like the federal solar tax credit and state and local rebates, grants and tax credits can bring down your costs by thousands. Additionally, professional photovoltaic contractors offer a range of affordable financing options, putting a whole-house system in anyone’s reach. Are you ready to explore your solar energy options? Intermountain Wind & Solar, the region’s leading professional photovoltaic company, offers free PV solar energy consultations to home and business owners throughout Utah, Nevada, Idaho, Wyoming and Colorado. To schedule yours, contact us today. Commercial solar power offers several significant benefits to businesses throughout the Intermountain West. In fact, this technology is quickly becoming a popular investment for savvy business owners. Could investing in a photovoltaic project be the right move for your company? When you check out the advantages of going solar, you may just be convinced. How much do you pay the utility company for your facility’s electricity? Hundreds of dollars each month? Thousands? With a commercial photovoltaic installation, those costs are drastically reduced. You may even be able to eliminate your electricity bills. You’ll enjoy free energy from the sun, while your competitors remain under the expensive thumb of the utility company. What business owner doesn’t love tax breaks? Install a commercial photovoltaic system, and your company will be able to claim the federal solar tax credit — a whopping 30 percent of your total photovoltaic costs. Some Intermountain West states also offer tax credits for solar installations, and local incentives may be available for businesses in some areas. Claim all of them, and your company may not have to pay Uncle Sam as much — or at all — next year. What if you decide to expand your company in the future and need to move to a different location? A commercial photovoltaic panel system is a solid investment, because it increases your property value. When it comes time to sell your building, your solar installation can help fetch you a higher price. As a bonus, you may find that your building doesn’t linger on the market for too long. Properties powered by solar energy are attractive to buyers and investors, so yours could sell more quickly than an equivalent building without a solar energy system. A commercial photovoltaic system can also be a powerful marketing tool for your business. Once your photovoltaic installation is scheduled, you can start sending out press releases and get your business in the news. You can also spread the word on social media. As time goes on, you can continue to reap the benefits of this free publicity by sending out photovoltaic project updates. But the public relations boost goes even further. Your company will be considered eco-friendlier than competitors who haven’t gone solar — an important distinction for many of your potential customers. Customers who aren’t as concerned with the environment will also respect your business acumen in switching to solar power. Saving your company a lot of money and establishing energy independence puts you in a savvy financial light. Are you ready to explore your photovoltaic installation options? Intermountain Wind & Solar offers complimentary consultations to business owners throughout the Intermountain West. Contact us today to discuss commercial solar power for your company. Have you considered installing solar panels? For most homeowners in the Intermountain West states, rooftop placement of a photovoltaic array is a cost-effective strategy for energy production. But what happens when it rains? Won’t all those holes necessary for mounting the panels make your roof leak? If you use the services of an experienced solar installation contractor, you won’t have to worry about this problem. To securely attach the photovoltaic mounting racks, PV installers will need to make some holes in your roof. But you don’t need to worry about water leaking through them. Photovoltaic mounting components are specifically designed for rooftop solar installations, and thus guard against roof leaks. Special flashing is installed around every rooftop penetration to help water flow safely away. To ensure a watertight seal, the holes are filled with high-quality silicone. Professional solar contractors are extremely cautious, taking every possible measure to keep your roof leak-free after photovoltaic installation. Do your homework and hire an experienced, well-qualified contractor — like Intermountain Wind & Solar — and your chance of a future leak won’t be any higher than any other roof. Over time, harsh weather takes a toll on any roof. Years of pounding rain, hail and sunshine can cause roofing products to degrade, increasing the likelihood of a leak. When you install photovoltaic panels, however, your rooftop is better protected from much of this weather-related damage. So your solar array may, in fact, help prevent roof leaks. In addition, rooftop solar panels can keep your home cooler in the summer. A photovoltaic array blocks heat from entering, reducing the need for air conditioning and increasing indoor comfort. As a result, your summer cooling costs will go down. Photovoltaic panels should only be installed on roofs that are in good shape. Think about it like this — solar modules are designed to produce electricity for decades, with little maintenance. If your roof is damaged, installing a photovoltaic system won’t prevent leaks. And if your roof develops problems once your photovoltaic panels have been installed, workers will have to remove the solar array to complete repairs. This is an added expense no homeowner wants. Older roofs should be inspected prior to planning a photovoltaic installation, in case repair or replacement is necessary. A professional solar contractor will look at your roof and point out any obvious damage that could affect your photovoltaic installation. However, if you have concerns about roof leaks, you should first consult with a licensed roofer. At Intermountain Wind & Solar, we take pride in our workmanship and use only the highest-quality photovoltaic mounting components to avoid compromising your roof’s integrity. Contact us today and schedule a free consultation to discuss installing solar panels at your Utah, Idaho, Colorado, Nevada or Wyoming home or business. With off-grid solar energy, living in a remote location doesn’t have to mean living without power. Stand-alone photovoltaic arrays provide a reliable source of electricity by harnessing the sun’s energy. Solar panel systems can work anywhere — even in locations that are way off the beaten path. To connect your far-flung home to the utility grid, power lines must be extended to your location. But you must pay to have that work done, and the farther away your home is, the more it costs. According to the Department of Energy, the cost of extending a power line averages between $15,000 and $50,000 per mile. So if you want to live several miles outside of the nearest town, you would have to shell out hundreds of thousands of dollars to access grid power. Installing an off-grid solar system makes better economic sense. It costs much less, and you’ll gain energy independence. But when it’s dark or cloudy, photovoltaic arrays don’t produce electricity. Solar energy storage can solve this problem, giving you around-the-clock power. Excess energy captured by your photovoltaic panels can be stored in batteries for later use. When sizing your battery bank, you’ll need to consider your daily energy usage, the size of your solar array and the weather patterns in your remote location. Mother Nature isn’t always kind to the Intermountain West, so make sure you have enough battery capacity to make it through an extended period of bad weather. A battery bank will give you continual power. But for total peace of mind, you may also want to invest in a backup generator. If cloudy skies stick around for too long, your batteries could become depleted. If so, your off-grid solar home could be left without power until the sun comes back out. With a backup generator, you’ll have an additional source of electricity that’s ready to use whenever necessary. Natural gas, propane or diesel generators all work well, and ensure that you never need worry about losing power. When properly designed and installed, a stand-alone solar energy system can meet all of your energy needs. The professionals at Intermountain Wind & Solar, the region’s leading photovoltaic contractor, are experienced in bringing power to remote locations throughout Utah, Colorado, Idaho, Wyoming and Nevada. Contact us today to begin exploring your options for off-grid solar. Homeowners are learning the truth about photovoltaic power — rooftop solar energy systems offer big financial savings as well as energy independence. Making the switch to solar is easier than you may think, yet misconceptions persist. Below, we debunk six of the most common myths about photovoltaic solar energy. Many homeowners grossly overestimate the cost of installing a solar energy system. Prices have drastically fallen over the last few decades, and many lucrative financial incentives are available today. You don’t have to be rich to switch to solar power. In fact, with the wide range of financing options available, people of all socioeconomic levels can now afford photovoltaic systems. Solar panels depend on sunlight to create electricity. Contrary to popular belief, however, warmth is not necessary. Solar energy works in any climate. No matter how cold it gets at your location, your photovoltaic array will continue to produce energy. In fact, light reflected from snow on the ground could even give you a boost in output. Back in the 1970s, photovoltaic panels were heavy, cumbersome and obtrusive. Today, that is very much not the case. Gone are the bulky, ugly solar modules of the past. Modern panels are sleek, low-profile and sophisticated, blending in better with rooftop surfaces. As the trend catches on and becomes more affordable, houses with panels on the roof are quickly becoming the norm. What if you decide to sell your home? Many people mistakenly believe that a solar installation will limit the pool of potential buyers. Actually, the opposite is true. Research shows that solar-powered homes typically sell up to 20 percent faster than similar properties without photovoltaic power. What’s more, buyers are often willing to pay an average of $15,000 more for homes with solar installations. Reaching the point where your solar energy system has paid for itself will take much less time than you probably think. In fact, many Intermountain West homeowners recoup their photovoltaic investment in 10 years or less. With a well-designed system, you may be able to break even in just a few years. A professional solar contractor simplifies the process of installing a photovoltaic system. Request a free consultation from an experienced local photovoltaic installer, and you can get all your questions answered. Professionals will also evaluate your property and electricity usage to design the most cost-effective solar power system. And if you add a backup battery bank, your solar array can meet your energy needs both day and night. When you choose a professional photovoltaic contractor, all the permits, inspections and paperwork required for solar installation will be handled on your behalf. Don’t be daunted by misconceptions. The professional team at Intermountain Wind & Solar, serving Idaho, Utah, Nevada, Colorado and Wyoming, can help you learn all you need to know about photovoltaic power. For your free consultation, contact us today. Your commercial solar array represents a significant financial investment, but it could be an attractive and easy target for thieves, depending upon its placement. In an hour or two, thieves could easily dismantle — and disappear with — a large photovoltaic array. Commercial solar panel systems take time to install, but removal can happen quickly. Fortunately, you can use some simple strategies to cut your risks. It may sound simple, but motion-detecting lights can be effective for deterring most thieves. Theft of commercial photovoltaic panels typically happens at night, when criminals can hide under the cover of darkness. No thief wants to work under a bright spotlight, so installing motion detectors near your solar array could help stop theft. Add an extra layer of protection to your solar array by installing an alarm system. If the alarm goes off when someone tries to disturb your photovoltaic panels, chances are the would-be thieves will not risk staying around until the police show up. If you don’t want to spend the money to install an alarm, you could post a sign that says your photovoltaic system is protected by an alarm. Most criminals read, and they may be less likely to risk a theft if they see a branded alarm company sign. Another potentially effective approach — albeit less high-tech — is to physically connect your photovoltaic module racks together. Using heavy-gauge, nylon-coated wire, interconnect the photovoltaic panel racks and secure them with strong padlocks. If all your panels are connected this way, thieves will realize that a lot of extra work will be required to remove the solar array. This may be enough to inspire them to choose another target. If you use this approach, take care to avoid covering any panel surfaces or interfering with the wiring. Installing a fence around your photovoltaic system is another potential anti-theft strategy. If criminals see that they’ll have to scale or cut through a fence to access the panels and to remove them, they may decide against stealing your photovoltaic system. The extra work involved in lifting the heavy modules over or through fencing may make the theft too time-consuming and complex. Be cautious about the exact placement of a fence, however, to avoid shading on the panels during peak sun hours. Some companies sell specialized nuts and bolts designed to guard against residential and commercial solar panel theft. Regular wrenches and screwdrivers don’t work on these locking fasteners. In fact, a special key is required to remove the hardware. Upgrading to these security fasteners does add a bit to the cost of a PV solar installation, but the price is minimal when compared to the cost of replacing stolen photovoltaic panels. 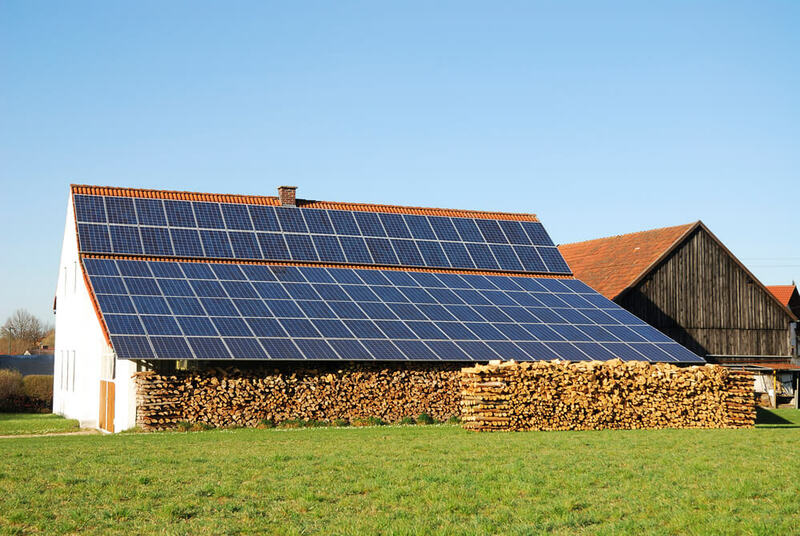 The professional team at Intermountain Wind & Solar, the region’s leading photovoltaic contractor, can help you determine the best way to protect your investment. Contact us today to schedule your complimentary commercial solar consultation.